Hours of Fun with NEW VTech Go! Go! Smart Furry Animals and Smart Wheels! We have a couple new favorite toys around the house that are great for all the ages of my children from 6 to 1! 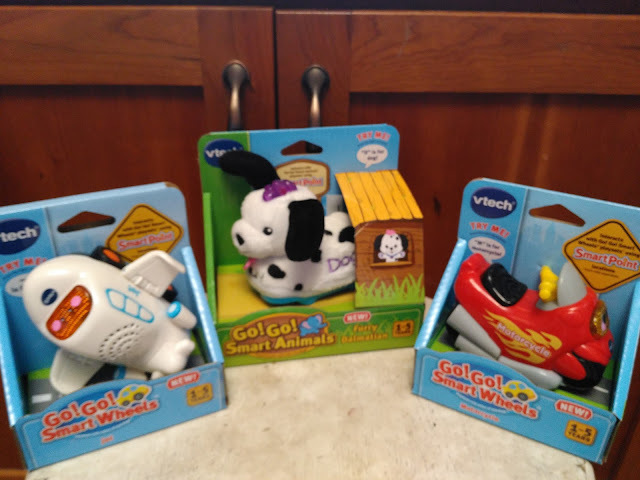 These VTech toys are NEW to the VTech Go! Go! Smart family and are hours and hours of fun! These Go! Go! Smart Animals Furry Animals and the Go! Go! Smart Wheels are the FAVORITE toys in our house right now and I LOVE watching my children all play together as they push around the furry animals and fun vehicles! Toddlers and preschoolers adore discovering these electronic toys with light-up buttons, music and sounds, while engaging in imaginative role-play. The Go! Go! Smart Animals® Furry Animals include several different cute animals including Caroline a charming cat, Dawn a dutiful Dalmatian, Richard a remarkable rabbit and Debbie a darling Labradoodle. All the animals are fun to cuddle with due to their soft fur an d plush heads. 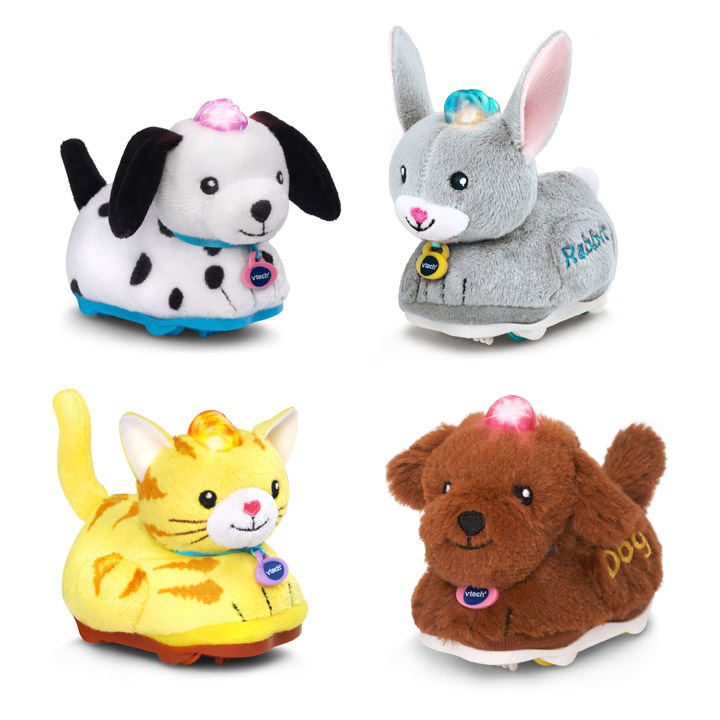 Press each of their light-up buttons to hear three sing-along songs and learn a letter and their animal name as kids play. 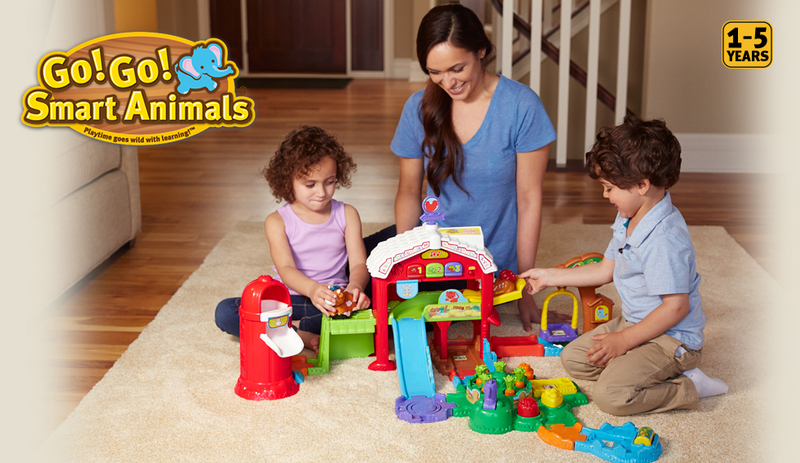 Push the animals to hear fun sounds and six melodies. While a melody is playing, push them again to add fun sounds on top of the melody. Each Go! Go! Smart Animals character is unique. Collect them all to experience their friendly personalities (each sold separately)! Ages 1-5 years, MSRP: $9.99 each. And the Go! Go! Smart Wheels® Vehicles allow children to cruise into the learning zone. These electronic play vehicles are perfectly sized for little hands and entertain children with a light-up button that activates music and sounds. Little ones will also learn about different letters and vehicle names through pretend play. The vehicles also respond to SmartPoint locations with different phrases and sound effects on all Go! Go! Smart Wheels playsets. A new motorcycle, jet, forklift and garbage truck join a line-up that includes a school bus, SUV, taxi, car, van, truck, ambulance, fire truck, police car, tow truck, helicopter, cement mixer, tractor, race cars, ATV, convertible, bulldozer, airplane and dump truck. Ages 1-5 years, MSRP: $7.99 each. 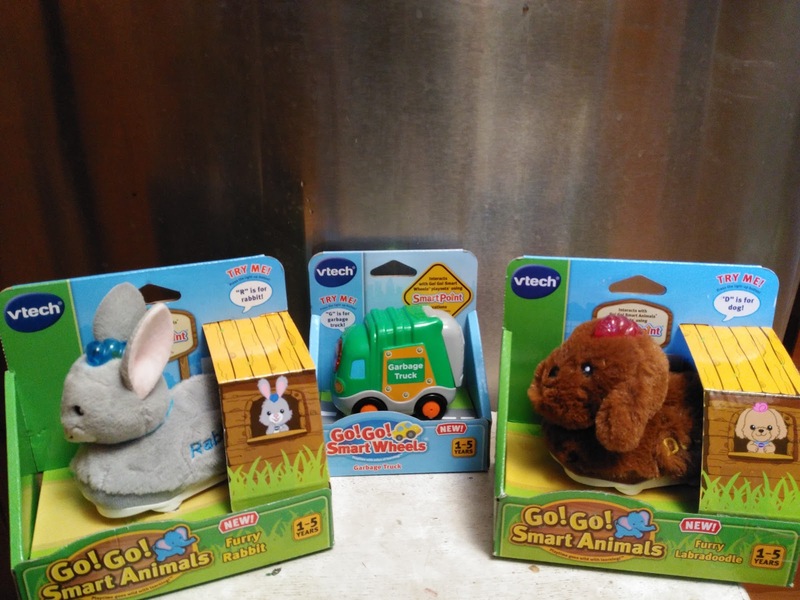 My children have spent hours and hours pushing around these animals and vehicles and they love how soft the animals are and how fun the Smart Wheels vehicles are! They have had a blast and I see many more hours of fun ahead! You can purchase VTech Go! Go! Smart Wheels and Animals from your local retail store or from the VTech website.